Metal collars, leather crop tops and cut out shirts. Not the newest things on my radar however they are worthy of their own post. So edgy I almost fall over. 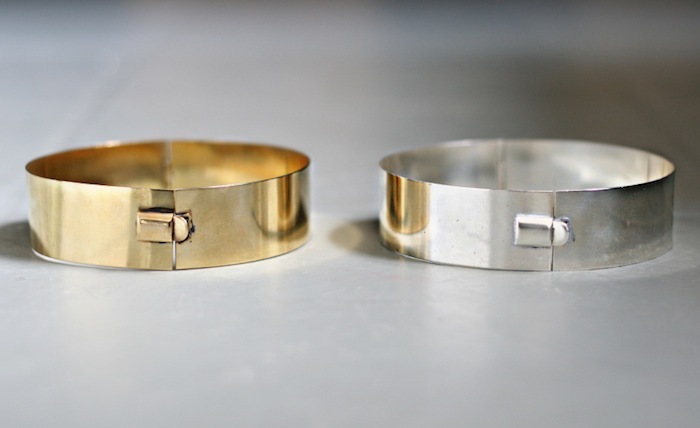 you're right, they are edgy pieces, especially the metal collars! I love cut out shirts! i agree, those metal chokers & accessories are definitely statement pieces! 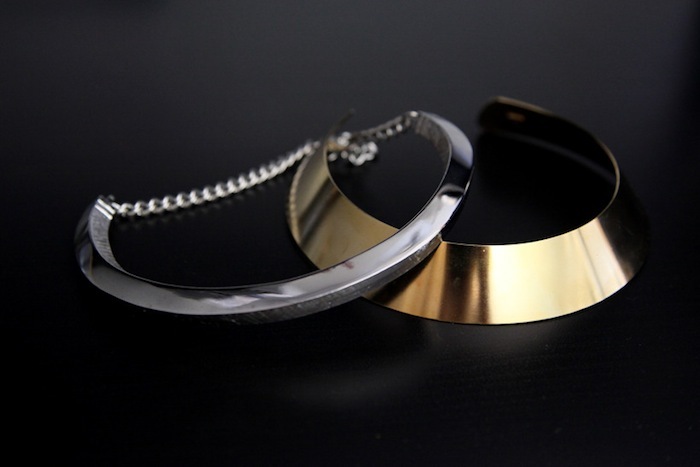 This post reminds me that I want to find a cool simple bracelet. EEP I want/NEED a collar. so gorgeous! Love this compilation! So inspiring. This post is the definition of egdy! But I love it. It has a very androgynous feel to it, which I love! Very IN this Autumn! i love chokers i'm mad about them! i love all pics! specially the fourth!!! These pictures are so awesome! Especially love the outfit with the metal belt with the skirt make for a very intriguing combination! Love it, the metal collars are so cool, almost like armour. sweet photos, i can't wait to get myself a silver choker. I like how sleek the metal colors look, but the leather crop tops and cut out shirts are a bit much for me. I want a metallic pieces! Amazing pics! tHanks for sharing them! Love the metallic cuffs/necklaces¿? from the first pic and the cut out shirt from the last one!! p.s second pic totally rocks me..kasia strus with that set!! cut out shirts are to die for!! I'm obsessed by these necklace and bracelet!!! I really love this post, love all items and need one real soon especially gold collar. any suggestion, about brand??? the first few necklaces,- really want.. i think they were by lindex, but they had to take them out of the stores because they were "dangerous". too bad. i totally agree. i still looking for the perfect of all three to put in my wardrobe. I love the combination of metal and blush tones in the first set of photos :) perfection! Love the 4 pics !!! Like my fanpage and maybe win an OPI nail lacquer !! Same, I'm on the hunt for one! I love the fourth image! I like the necklaces! Very interesting pieces! Love that last photo - the blouse with the pop-out collar. It's gorgeous and I already know it will stick with me!! Stocking metal collars/chokers over at www.filthymagic.com and if you have access to swedish site nelly I just had my mom order me one that looks exactly like the 1st picture you have here. I'm stalking my mailbox now. 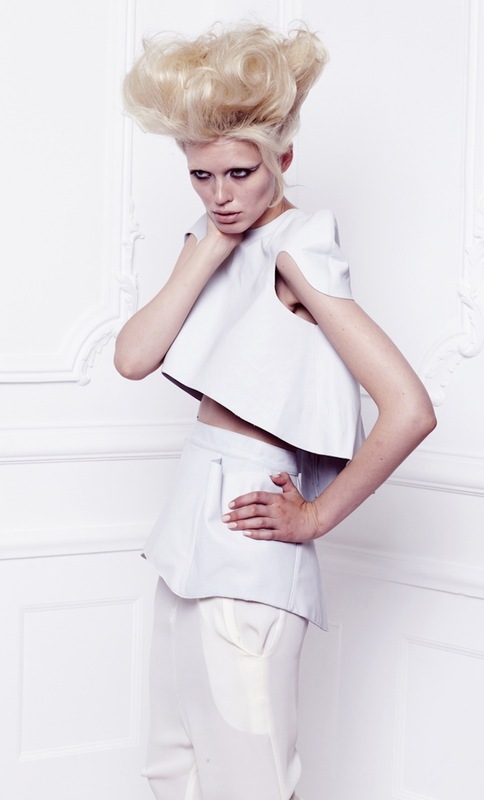 i lovvve all of the ellery pieces in this post. it's my absolute fave brand. ps. yay! i'm so glad that google has enabled you to find my blog. yours is pretty wonderful aswell, sweetie! x.
I also like to just browse for really Beautiful photos on the internet, These shoots are gorgeous!